While it makes sense to take a strategic approach towards collaboration software, as a tool which will have far reaching effects on how a business operates, oftentimes, businesses opt for collaboration software in response to an immediate problem. This is a first of a series of informative articles we will feature on the HyperOffice blog that deal with common problems that businesses face, and how they can be solved by HyperOffice as well as other solutions. 1. This is applicable if you are an iTunes user. You need to follow the following steps. 5. You need to open the Info tab in iTunes, and select “Outlook” from the “sync contacts with:” and “sync calendars with:” drop down. - You need to connect your iPhone to your computer everytime you need to sync. - It is only one-way sync, meaning your Outlook information will appear on your iPhone, but not vice versa. 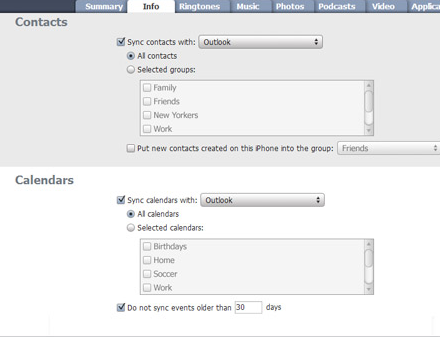 - Although iTunes has a “sync email” option, it only syncs email settings and not messages. To sync email between iPhone and Outlook, you need to set up the same IMAP account on both. Using a web service like HyperOffice. 2. Set up synching between HyperOffice and Outlook using the HyperShare add-in. 4. Click Setup Phone, and Select the manufacturer, model & carrier from and enter phone number. Click continue. 5. In this step, enter code received on your mobile device and click on verify. 6. On the next screen, select data items to sync. 7. Once HyperOffice is set up, you now need to set up your iPhone. First you click on settings on your iPhone and scroll down & tap Mail, Contacts, Calendars. 8. Tap Add Account & select Microsoft Exchange as the type of account. 9. Enter HyperOffice email address and the password. 10. In the new server field enter hypersync.hyperoffice.com and hit next and select the services (Mail, Contacts, Calendars) you wish to sync. Read more, or contact us for more information..
5. On the next screen, fill out your Email, Domain, Username, Password, and Description. 6. If auto-discovery is enabled in Exchange, the next screen will be automatically prepopulated. If not, you need to fill out the server information, and click next. 7. Now iPhone displays a list of data types you want to sync – mail, contacts and calendars. Click on “save” to complete the process. - You need to have Exchange Server installed, which is typically an enterprise product costing up to thousands of dollars. This is not an optimal solution for SMBs. - If you want to extend syncing capabilities beyond iPhone, Exchange does not support non ActiveSync devices.